Facilities management, the integration of people, space, and process, has enabled businesses to substantially improve their operations. Enterprise software and connected technology has provided a means for better management of equipment maintenance scheduling. Facilities management platforms have penetrated the market in recent years, and with it, more opportunity to reduce equipment downtime and improve operations at large. As with any technological progress, an important question to ask is: what's next? In this post we’ll explore the benefits of a facilities management platform and how to take it one step further to realize greater ROI and automate previously manual tasks. What is a Facilities Management Platform? Facilities managers have a wide variety of responsibilities, ranging from customer satisfaction tasks to maintenance scheduling. Because of this, facilities managers have required unprecedented visibility into employee interaction with equipment, and how that equipment is performing its duties. Software companies have created robust solutions to accommodate the increasing needs of these demands, allowing for a new age of business process optimization. So what exactly is a facilities management platform, and why is integrated facilities management important to the functionality of a business? Facilities management (FM) systems, as outlined above, respond to the many responsibilities of facilities personnel. One of the most powerful outcomes of successful deployment of FM software is improved business processes as it relates to people and equipment. In order to effectively manage this at scale, organizations are increasingly turning to robust platforms that can provide insight and visibility into these diverse responsibilities. Facilities management platforms consolidate equipment insights into a single view. This saves considerable effort when managing equipment maintenance schedules. However, many organizations are working in reactionary environments, and do not take full advantage of an integrated facilities management strategy. By consolidating maintenance tasks and those responsible for them, organizations can better prepare themselves for equipment downtime. There are three primary maintenance strategies, each with their own strengths and weaknesses: preventive, predictive, and reactive. Preventative maintenance, routine action taken on equipment to prevent downtime, is primarily based on expected lifetime of a particular piece of equipment. This is a very common strategy due to its effectiveness, however, this does not take into consideration actual wear and tear on the equipment. Depending on use, effective maintenance schedules can be dramatically different than what is anticipated with a preventative strategy. Predictive maintenance improves on preventative maintenance and considers the actual condition of equipment through advanced sensors that monitor performance. Both methods enable proactive equipment maintenance, which is far more effective than reactive maintenance. Facilities managers can spend up to 80% of their time reacting to equipment performance issues. This can be reduced through adopting predictive maintenance strategies. Rather than waiting until a problem occurs, facilities managers can address equipment proactively, improving efficiency through reducing downtime. This helps to keep costs down by decreasing the frequency of required maintenance. 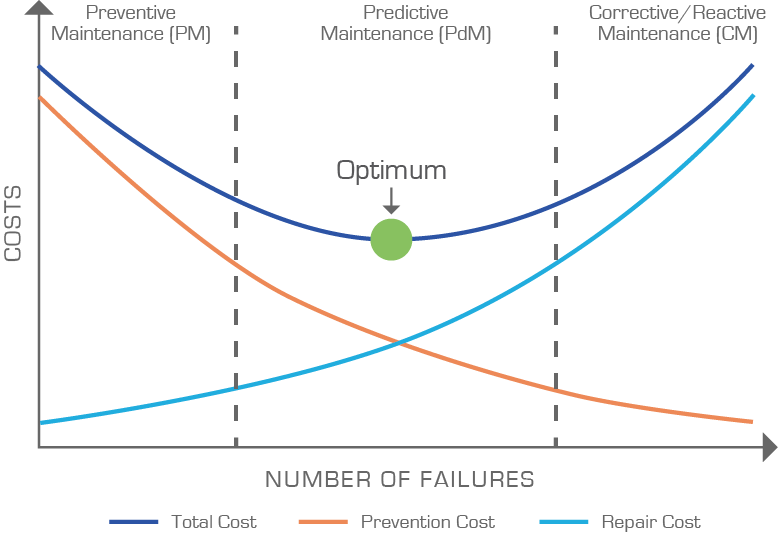 Preventative and predictive maintenance anticipates issues before they occur, saving costs and maximizing uptime. In order to effectively implement this strategy, advanced IoT sensors are needed to help predict and plan for equipment failures. While this is an improvement over reactionary procedures, there is still opportunity to automate the scheduling of tasks. Enhanced visibility into equipment monitoring can help automate maintenance scheduling. Associates need to manually enter information about equipment to create work orders, who then interface with technicians to ensure the task has been completed. This tedious process tends to be error-prone, and takes time away from other valuable tasks. By implementing IoT connected sensors, processing work orders can be done seamlessly and automatically. In addition, IoT sensors extend reporting capabilities to equipment, providing further insight into performance. By analyzing equipment performance, facilities managers can make more informed purchasing decisions when considering new equipment.